Everton slumped to a third straight Premier League defeat as Marco Silva's first visit to Vicarage Road ended in a forgettable 1-0 loss to Watford. Dismissed by the Hornets in acrimonious circumstances just over a year ago, Silva has not enjoyed the kind of progress he would have expected during his maiden season in charge of Everton and his current club is now four points adrift of his former employer. Andre Gray, introduced at the interval, provided the lone goal — his fifth in all competitions this term — by capping off Craig Cathcart and Will Hughes's classy combination in the 65th minute. A game otherwise short on attacking quality ended with Everton mustering little beyond a misdirected Dominic Calvert-Lewin header and remaining ninth, while Watford's second win in eight Premier League engagements lifts it to within a point of seventh-placed Wolverhampton Wanderers. 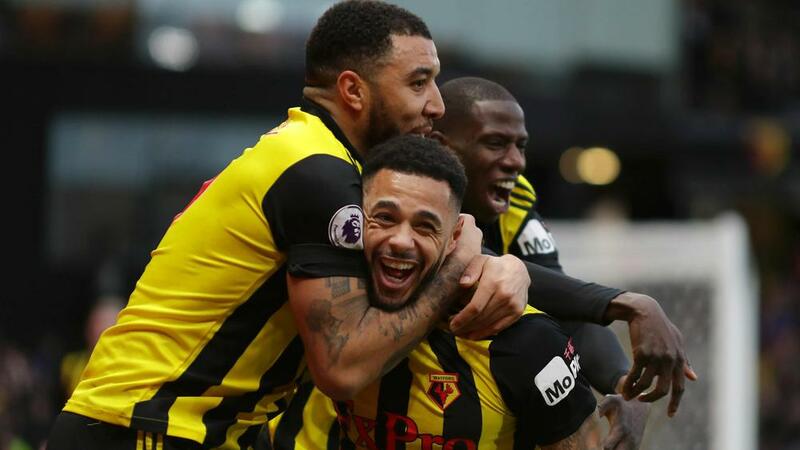 Troy Deeney, having fanned the flames of Silva's return with some incendiary comments about his former manager during the week, helped construct the game's earliest chance, cushioning a Daryl Janmaat cross into Etienne Capoue's path for a close-range shot that flew off Jordan Pickford and over the bar. Kurt Zouma and Cenk Tosun both worked Ben Foster as Everton settled into the match, which remained goalless at the break after Gerard Deulofeu's poor connection with a Will Hughes cutback. Gylfi Sigurdsson went closer within five minutes of the restart, instinctively lobbing a loose ball onto the top of the crossbar from inside the box. But it was centre-back Cathcart who ultimately who provided the unlikely instigator of the decisive moment as his clever reverse pass set Hughes free in the box to square for an unmarked Gray, who made no mistake with the simplest of finishes for the winner. Everton's back-to-back home defeats added to a growing sense of discontent at Goodison Park and this result, along with the rather limp performance that underpinned it, will have done little to assuage the supporters who are unhappy with the team's direction under Silva.